As someone who hates clutter the simplicity of this kitchen really appeals to me. 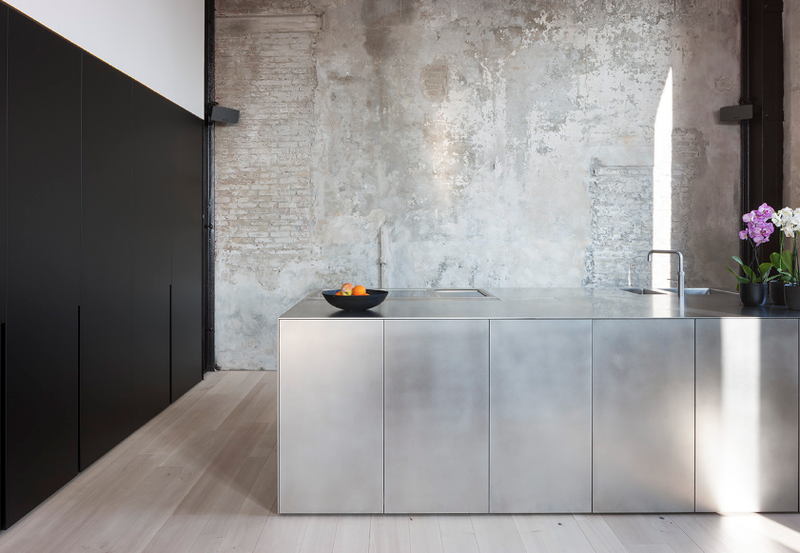 I love the handleless cupboards and the monolithic island - the clean lines really stand out against the rough texture of the wall behind. This image sums up the wabi sabi aesthetic of 'the fullness of emptiness'. As first glance it looks pretty bare but when you look closely there's quite a lot happening: four different materials, four different surfaces, contrast and harmony all in one. Sometimes less really is more. It is said that for a true indication of your interior style you should take a look inside your wardrobe. The colours and patterns that we wear are often repeated when decorating our homes and in my case this is spot on. I like white. I like grey. I like black. Sometimes I can be daring and go with bright pink or a Breton stripe, but mostly it's monochrome. I find it difficult to resist these colours when shopping for clothes, which is probably why I have ten white t-shirts and fourteen grey jumpers! How many grey jumpers is too many? My Pinterest boards are pretty much the same, most of my pins go in to the boards titled 'Pale & Interesting' or 'Amazing Greys'. In this new series, I thought I would show you some of my favourite monochrome interiors and accessories, so where better to start than one I styled myself? This property in Mayfair is a masterclass in minimalism! I love the black shelving and floor and the white really allows the features of the room to stand out. Watch out for more Monochrome Moments coming soon!